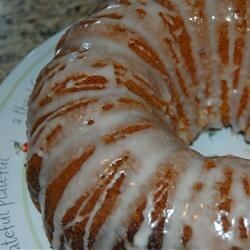 "A tangy moist glazed cake. Nice for simple gatherings and dinner parties." Preheat oven to 350 degrees F (175 degrees C). Grease and flour one 9 or 10 inch tube or bundt pan. Combine the lemon cake mix, eggs, brown sugar, flaked coconut, 3/4 vegetable oil, 3/4 cup apricot nectar and the lemon extract. Beat with electric beaters for 4 minutes at medium speed. Pour batter into the prepared pan. Bake at 350 degrees F (175 degrees C) for 30 to 40 minutes. Let cake cool in pan for 10 minutes then turn cake out on to a serving dish and immediately pour glaze over still warm cake. To Make Glaze: Combine the confectioners' sugar, 2 tablespoons apricot nectar, 1 tablespoon vegetable oil and enough lemon juice to give the glaze a liquid consistency. Mix until smooth and use immediately to pour over still warm cake. Moist and delicious as promised. I used Mango nectar in place of apricot because it's my husband's favorite. I made this cake for his birthday and it was a big hit! I made this cake and omitted the brown sugar and added a 3.4 oz. pkg. of lemon instant pudding instead. I had to bake mine for 50 min. It was a big hit. Everyone loved it! Thanks for sharing! This is a great moist cake. I didn't get to glaze it while it was warm but it was good and I got rave reviews!